10 Oct 2016 According to a recent Forbes article, digital health entrepreneurs are raising more capital than ever (probably). 12 Oct 2016 Since the majority of today’s consumers and businesses are online, digital marketing skills have never been so important. Here are 10 Must-have skills for 2016 and beyond. 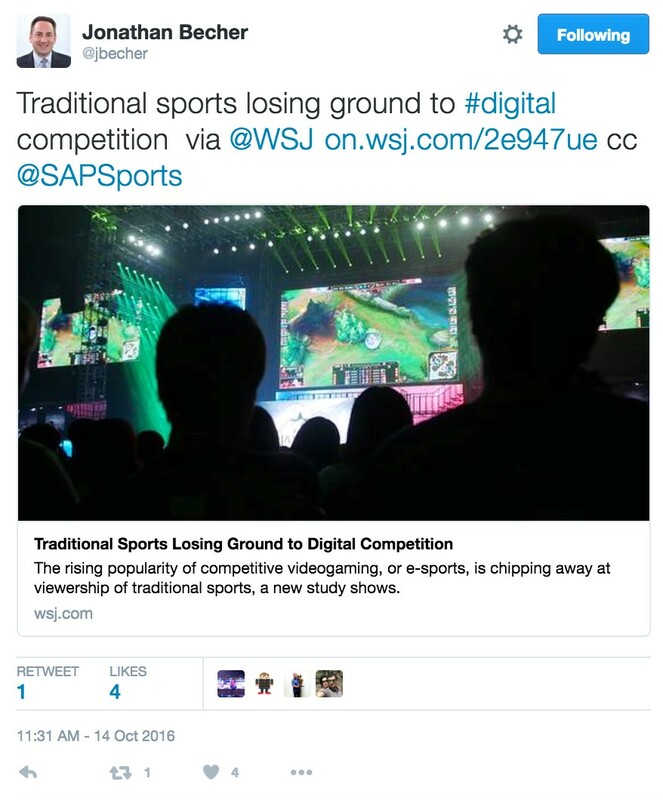 14 Oct 2016 e-sports are chipping away at viewership of traditional live sports like football and baseball, reports the Wall Street Journal. 15 Oct 2016 The U.S. digital infrastructure needs more private investment. And the Harvard Business Review thinks the American government should orchestrate it. 16 Oct 2016 The U.S. truck industry is scrambling to comply with a looming regulation that will force companies to electronically log employee hours in an effort to keep tired drivers off the road. 18 Oct 2016 When you click “buy now” on many digital marketplaces, ownership may not mean what you think it means. Slate investigates here. 19 Oct 2016 Harvard Business Review thinks you should take a portfolio approach to balancing your company’s digital investment. Find out why here. 20 Oct 2016 What are Gartner’s crystal ball predictions for 2017? Apparently, blockchain, augmented reality, Internet of Things and voice interfaces will have major business implications in the future. 21 Oct 2016 Gartner thinks traditional firms worried about companies like Apple and Amazon should copy, not compete with tech giants. The Wall Street Journal has the full story.